The dirt and gravel parking lot at the corner of South Water Street and Tockwotton Street is modestly sized, giving little clue to the extensive iron foundry complex that once existed on the site. 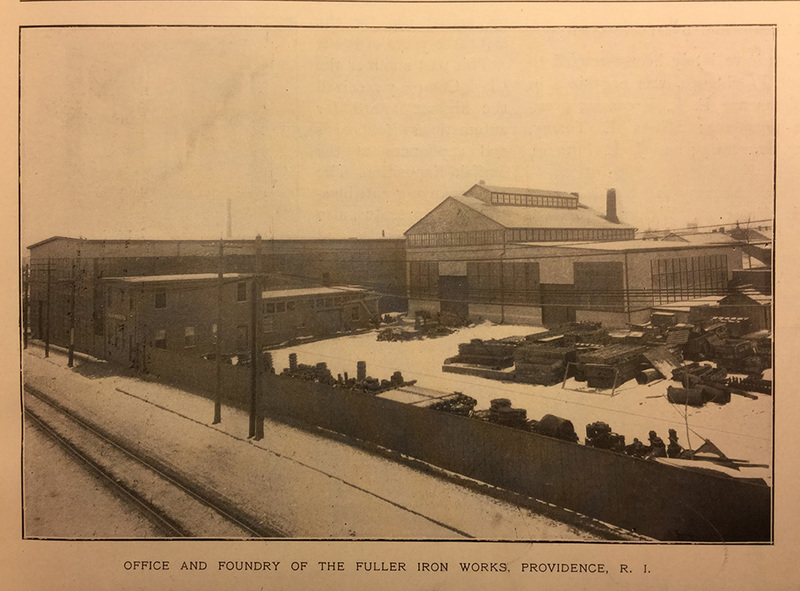 The Fuller Iron Works, founded in 1840, was a manufacturer of "small steam engines; but particularly hoisting for a great variety of uses--coal docks, quarries, ships' use, etc. Also ice elevators, machinery, castings of all kinds, water steam, and gas pipe, and every variety of special castings for same," according to The New England States. 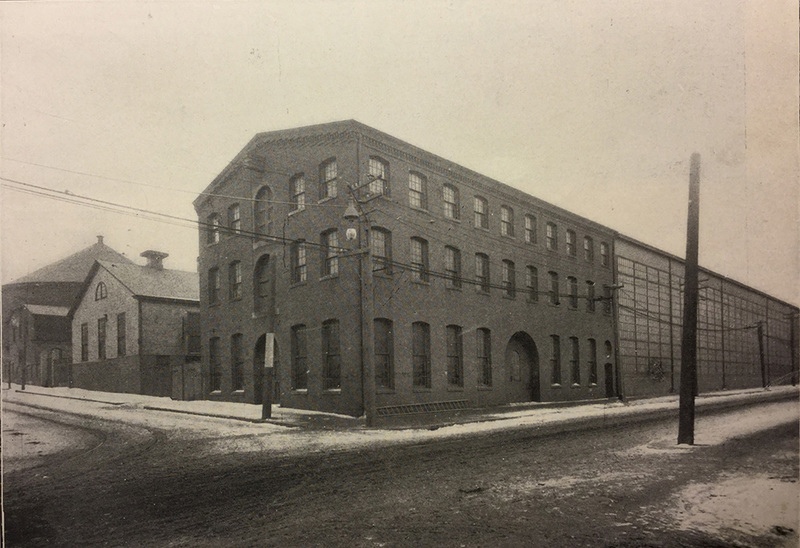 In 1840, Frederick Fuller purchased a series of wooden buildings that the Fox Point Foundry Company had built but never operated; he filled them with equipment and opened his iron foundry that same year. When he died in 1865, his sons, Frederic and George, inherited the business; they eventually tore down the wooden buildings, erecting a dramatic, brick and steel replacement in 1893. The main iron works adjoined an older, 3-story brick building (still standing), which served as the machine shop. To the rear was the office, foundry, and a large fenced yard, extending into what, in 2019, is a grassy field bordering South Main Street. The works was designed and built by Berlin Iron Bridge Company of Berlin, CT, which produced large steel support beams for bridges and industrial buildings. It was a notable building during an era of innovations in steel framing, with long expanses of windows alongside load-bearing brick curtain walls enclosing a steel frame. The striking, heavy ribbed-glass windows on three sides filled the cathedral-like interior space with "perfectly diffused light." One source claimed that "it is probably the best lighted machine shop in the country." A foundry building was added in 1901, using the same glass and steel construction technique. After the iron works closed, the building briefly housed a nightclub and other sundry businesses in a portion of the cavernous space; at some point the windows were covered over with asbestos tiles, which remained in place until right before the building was demolished in early 2012. As of 2019, the building site is a surface parking lot, with a sign advertising a "mixed-use development opportunity." 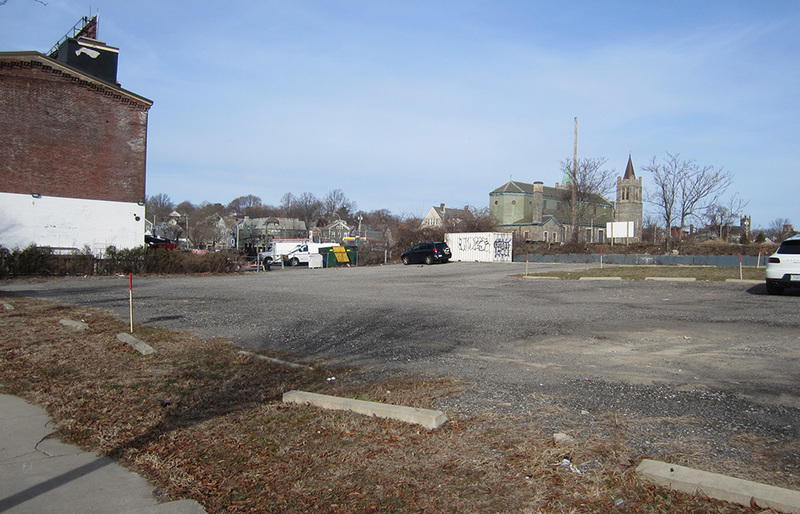 Parking Lot on Tockwotton Street: This gravel parking lot occupies the former site of the Fuller Iron Works building. 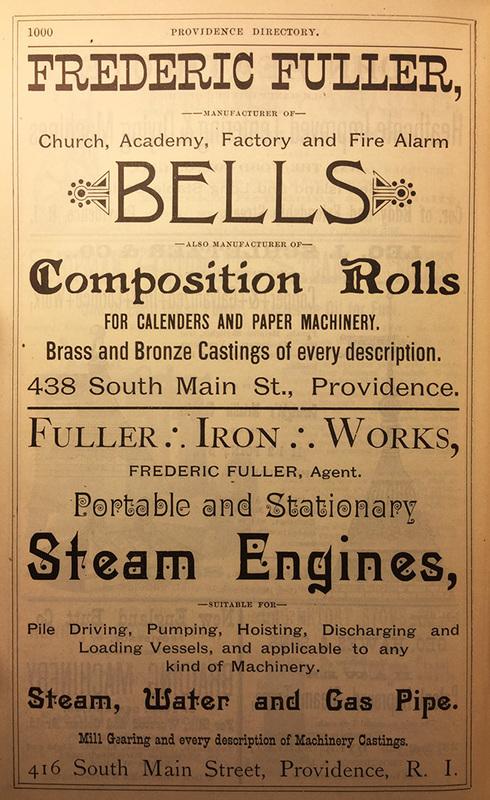 Frederic Fuller, owner of Fuller Iron Works, also operated a separate foundry across the street specifically for bell manufacturing, which provided "church, school, factory and fire-alarm bells, heavy brass and bronze castings of every description, composition rolls of calenders and paper machinery." The Berlin Iron Bridge Company also designed several extant buildings in Providence, including the Providence Gas Company Purifier House at 200 Allens Ave and the Beaman and Smith Company Mill at 20 Gordon Ave, as well as the Interlaken Mill Bridge in Coventry, RI. The Art in Ruins website includes some beautiful photos of the Fuller Iron Works building in 2012, before it was demolished. Angela DiVeglia, “Fuller Iron Works,” Rhode Tour, accessed April 23, 2019, http://rhodetour.org/items/show/357. Bayles, Richard M. History of Providence County, Rhode Island. New York: W.W. Preston & Co, 1891. v. 1, p. 617. Bradley, Betsy Hunter. The Works: The Industrial Architecture of the United States. New York: Oxford University Press, 1999. Davis, William T. The New England States: Their Constitutional, Judicial, Educational, Commercial, Professional and Industrial History. D. H. Hurd, 1897. p. 2548. Providence Board of Trade Journal, v. 14, no. 1 (Jan 1902). p. 15. Hall, Joseph D., Jr. Biographical history of the manufacturers and business men of Rhode Island at the Opening of the Twentieth Century. Providence: J.D. Hall & Co, 1901.